I love the deceptive toughness of snowdrops. Yes, they appear fragile; tiny, delicate flowers, their heads hanging bashfully atop slender stalks... but in reality they have the strength to pierce their way through rock-hard soil, braving frosts and icy winds to flower defiantly. 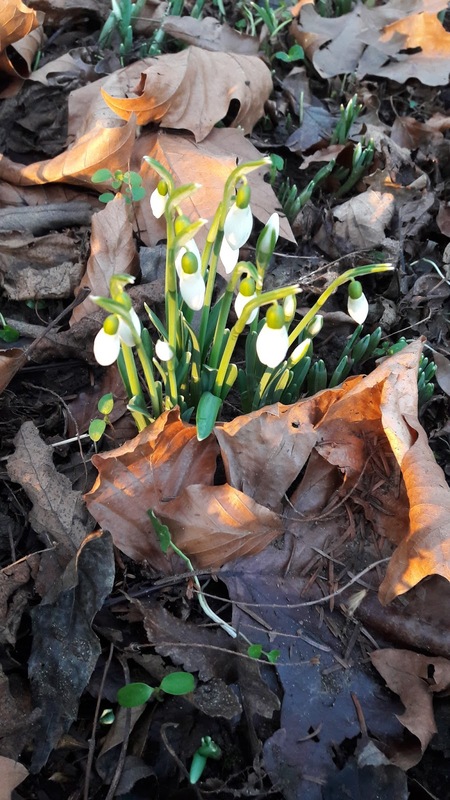 Their arrival, just after the midpoint of winter, brings hope and the reminder that, however icy the air, we are slowly, surely, heading towards spring. I saw my first flowering snowdrops of this month on Friday in the early evening, palely luminous in the gathering dusk. The next day, in sunshine, I saw a large patch of them in University Parks, valiantly emerging from beneath a blanket of leaves, several clumps already flowering. I moved in to take some photos, stepping carefully in order not to crush any of them underfoot. As I crouched, gingerly poised, each foot a sliver of an inch away from some flowers, a large Labrador bounded along, shuffling and snuffling through the leaves, blissfully unconcerned about the nascent life beneath its paws.